by Teresa Hennig, Ben Clothier, George Hepworth, Doug Yudovich !!!!! “This was truly an MVP achievement!!! We must have set a record for the number of Access MVPs on a book team -- including many of you. As more people were recruited to ensure the caliber and content, I created new roles and convinced the publisher they are such an integral part of this team that they should ALL have their bios in the book! You’ve GOT TO check them out!!! Here’s the team … do you recognize everyone??? Written by a team of Microsoft Access MVPs, this book leverages our expertise and passion for Access. In expanding the reach of Access, we incorporated the knowledge and experience of over a dozen experts to consult, test, and provide examples working with SharePoint, SQL Server, .NET, and web development. And to make sure that we could provide a model for a robust business solution, we worked closely with the Microsoft Access team to be at the forefront of defining, testing, and implementing the new features for Access 2013 web apps. By Teresa Hennig, Rob Cooper, Geoffrey Griffith and Jerry Dennison, contributors and editors, Armen Stein, Jeff Boyce, Albert Kallal, Doug Yudovich, Ben Clothier. Tips contributed from our esteemed colleagues Dane Miller, Garry Robinson, Steve Schapel, and Larry Strange. Contact Teresa for a signed copy -- or order from Amazon with Teresa’s link. EARLY REVIEW: "I have to say that you have surpassed yourself with the Access Programmer's Reference this time. Very, very nice. I usually use books like that for reference, to look up stuff when I have a question, but in this case I have literally been reading it in large chunks and finding it hard to put down. Especially the new Access 2010 functionality, I have already learned heaps. So thanks a lot for that, I just wanted to let you know that I am mighty impressed with this one. :-) "
NEW BOOK on Database Design Structure! Learn how to design properly normalized database models for dozens of business applications. The companion CD contains 31 database models! "This book has extensive coverage of an area vital to Access developers and power users. 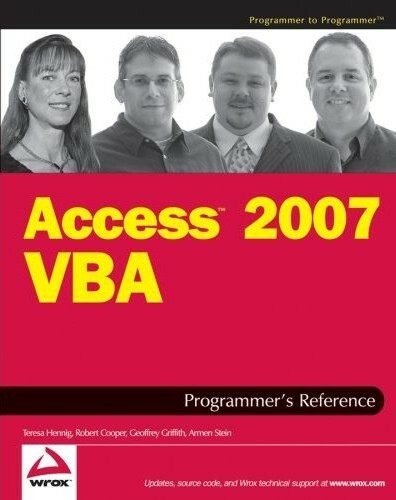 ... Then the book covers VBA from the basics to in-depth advanced levels. It is a worthy successor to the Access 2003 VBA Programmer's Reference and, in my opinion, "raises the bar" for VBA books." From the fundamentals through complete examples for Access, Excel and Word, this book provides the information and walks you through the steps to customize and create Ribbons in all three programs. Although written primarily for 2007, most aspects apply to 2010 and several areas are applicable to Office 97 through 2003. I love your books. I have them all. 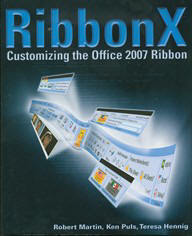 RibbonX 2007 helped me creating stunning ribbons for my Access applications. Everything about the Ribbon is new; all serious developers will need, and many others will want, to know how to customize it, and this book tells you how to do it. The authors have done a splendid job of explaining it all without assuming any prior knowledge, guiding the reader through the jungle of VBA and XML in three different applications. It is a huge subject and different people will want different things from it; the book is packed (but not cluttered) with clear cross-references so that you don't have to read everything to get up and running with the particular thing you want to do. No matter what your ability or experience you will learn from this book, I already have. As computer books go, it's better than most, it's cheap, and worth far more: buy it! 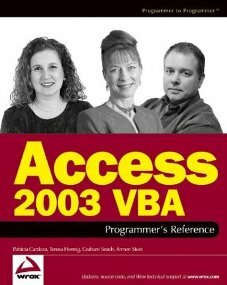 Access 2003 VBA Programmer's Reference, By Patricia Cardoza, Teresa Hennig, Graham Seach and Armen Stein with contributions from local developers, Randall Weers, Brian Sockey and Sam Radakovitz. What an adventure! As the Coordinating Lead Author, I was privileged to create a team of four co-authors and bring in the talent of some wonderful local developers as contributors. Readers benefit from the wealth of expertise and a variety of perspectives. If you follow the explanations in this book, you are going to fully understand how relational databases work. If you follow the methods described in this book, you are going to have the best designed databases. Easy to read and easy to follow. A must have book. A CD-ROM/book reference outlining techniques for using Jet and comparing it to other database applications. Chapters cover data management, performance and security, developing client/server applications, and working with other applications, and demonstrate points with an ongoing sample Visual Basic program. The accompanying CD-ROM contains code examples and sample files, technical articles, and the DAO Software Development Kit. For programmers familiar with a procedural language, relational databases and queries, and SQL. Complete guidance, including examples, for using the powerful database engine used in Microsoft Access, Microsoft Excel, Microsoft Visual Basic(r), Microsoft Visual C++(r), and Microsoft Office 97, Developer Edition. It shows how to reuse code in many products and how to combine products into custom database applications. The accompanying CD-ROM contains all of the book's code samples, useful tools, and utilities. This is the first book of its kind! Microsoft Access uses a specific dialect of SQL known as Jet SQL to communicate with the Jet Engine. This book shows you how to talk directly to the Jet, bypassing the query design window. Why would you want to? You can't really take advantage of all the Jet has to offer until you can speak its language. The first part teaches you the rules and syntax you'll need to master to talk Jet SQL. The second and third sections show you how to upside an Access database to an Access Project and discusses some of the changes the Access Developer will face when working with SQL Server, including Stored Procedures, Functions, and Views. These sections are full of helpful hints and warnings. Understanding Jet SQL opens new possibilities to more efficient solutions that are easier to build than conventional methods allow -- once you know the language. A guide for Access power users and developers who are ready to build database applications with SQL Server. 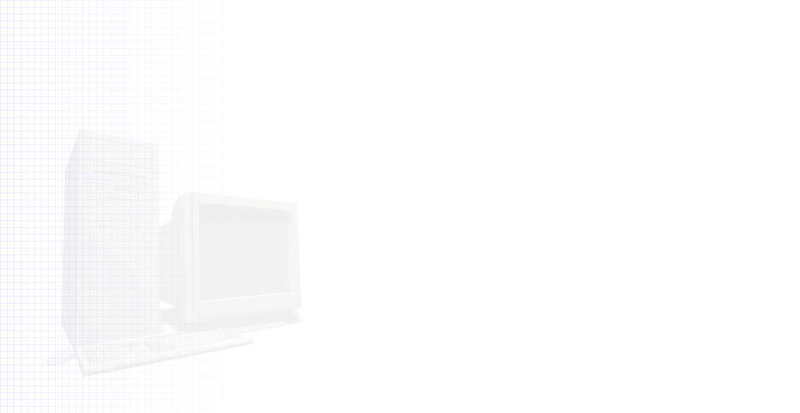 Coverage includes converting an Access database to SQL Server, SQL Server fundamentals, SQL Server security, and linking to SQL Server using Access databases. Other subjects are Active X Objects, designing and creating an SQL Server database, programming effective stored procedures, architecture distributed n-tier applications, and deployment, tuning, and maintenance. Chipman and Baron are consultants in the private sector. Microsoft Access 2000 Developer's Guide to Microsoft SQL Server provides much needed information and guidance for the Access power user or developer who wants to exploit the power of SQL Server. Written by Access experts and Microsoft MVPs Mary Chipman and Andy Baron, this hands-on guide provides you with the practical knowledge you need to harness the enterprise-level power and scalability SQL Server offers, while using the Access tools you are familiar with.